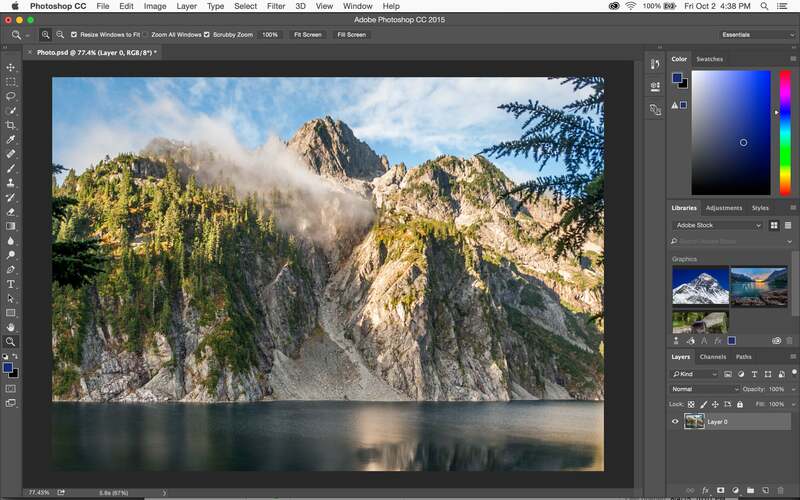 Although Photoshop very much remains the shorthand for photo editing, there’s a huge range of options available on the market right now, so you don’t have to necessarily stick with Adobe’s offering. In this list we’ll go through some of the best photo editing software currently available. Some of it is pricey, some of it is cheap, and some of it is completely free. What you need may depend on the type of photographer for you, so read on to find out which software could be the right one for you. We may as well start with the most recognisable brand on the list. Photoshop has been around for over 20 years now, but the introduction of Creative Cloud makes it much more affordable than ever before. Rather than paying a lump sum up front for the software (which previously ran to hundreds of pounds), you pay a monthly fee for Photoshop and Lightroom. The Photographer’s Package is available for just a few pounds a month and it means that you always have the most up to date version of the software available, and if you decide it’s not for you after your first year, you can always cancel the subscription too. Both Photoshop and Lightroom are incredibly powerful photo editing software and offer a very comprehensive range of editing options. It’s ideal if you’re going to edit pretty much all of your photos, or are a professional. If you only want to do the odd touch-up though, it may be best to consider one of the other options on the list. The baby brother of Photoshop CC’s full package, Elements is now in its 14th version. You can do a lot of the same editing as you can in Photoshop CC, but you pay for the software up front. If you don’t think you’re going to want to upgrade for a few years, it’s a cheaper way of doing it, and you could also perhaps consider buying an older version of the software to save even more money. If you want to make edits such as to brightness, contrast, spot healing, straightening and so on, Photoshop Elements can do all of that for you. Even better, if you’re a beginner to editing, Guided Edits will walk you through some of the more complicated edits, so it could also be a good training ground for an eventual upgrade to Photoshop CC. Available at a bargain price without skimping on capability, Serif’s latest PhotoPlus X8 has an impressive list of features. It’s sold as a credible alternative to Photoshop, and as such, it has a lot of very similar editing functions making it a good choice for those who want the power of something like Photoshop but want to save on cash. You can also import and edit PSD (Photoshop) files, so if you’ve got a back catalogue from older versions of Photoshop there’s no problem there. This software is available for Windows users only, but Serif has an alternative option for Mac users – Affinity Photo (see next). To give you an idea of whether you’ll enjoy PhotoPlus, you can download the PhotoPlus Starter Edition for free. Exclusively available for Mac users, Affinity Photo promises big things – namely to be the best photo editing software available for Macs. As such, it’s been designed to get the best out of Macs, including retina 5K iMacs. It’s available for the low price of £39.99 and makes much of the fact that there’s no subscription (a la Photoshop CC) making it the same price as less than five months of Adobe’s software. With an extensive feature set, including raw image support, Affinity is good for both enthusiasts and professionals. If you just want to make a few quick edits it’s also good, but there’s support for much more complicated edits too. It went through an extensive Beta phase, so you can feel reasonably confident that any kinks or problems have already been identified and addressed. You can download a free trial of Affinity Photo to see how well you get on with the software before committing to buy. If you shoot in raw format, the DxO Optics Pro could be a fantastic option for you. The software checks the camera and lens combination used to shoot a photo and automatically applies lens corrections. You can make other edits too, or export edited images into other software, such as Photoshop. DxO gives you the option to make edits such as removing haze, noise and optimising lighting conditions. There’s two versions of Optics Pro available, depending on the level of editing you need. The Essential version is cheaper, while the ELITE edition costs more but features extra functions, such as extra denoising options, output formats and the ability to customise your workspace. Again, you download a free trial of either version to see which one is right for you. If all you need to do is Organise your photos and make (reasonably basic) edits, Apple’s replacement for both iPhoto and Aperture, is a great starting point – especially as it costs nothing. If you’ve got a Mac, and an iPhone, and an iPad, it’s also great for synchronising your images across devices using iCloud. If you edit on one device, those changes will be seen on the same image across your devices. You can also add extensions to Photos, such as those from MacPhun, if you need greater editing options than what the Photos software already provides. Those with the latest version of OS X should already have Photos installed. Another good option for those looking to make minimal edits, such as cropping, free tool Picasa is owned by Google and therefore guides you towards sharing on Google products such as Plus, YouTube and Blogger. You can share to other social networking sites, but it’s a bit more of a long-winded process. The software is a download to your computer, from where you’ll be able to organise the photos stored on your device, with a couple of sorting options, such as by person. Although there are some editing tools available, they’re limited and can be applied to the whole image only (so no localised editing). But on the other hand, it’s free, so you’re not losing anything by trying it out. Another good choice for those who edit a lot of raw format files, Capture Pro 8 has been specifically configured to work with more than 300 high-end cameras. PhaseOne says that each of the supported cameras is rigorously tested and profiled to get the best results in terms of colour reproduction and noise reduction to match the camera’s characteristics in various shooting conditions. On the downside, you can’t send a photo back and forth between external photo editors, such as Photoshop, so it’s a bit of a clunky workflow. One of the more expensive pieces of software on this list, but you can sign up to a monthly subscription (with a three or twelve month minimum) term to make it easier to afford. There’s also a free 30-day trial available. For a free photo editing package, GIMP offers a lot. There’s some fairly powerful editing available and the ability to customise your workspace. There’s touch-up tools for removing blemishes and so on, and it’s capable of reading a wide variety of file formats. What once was a fairly cheap alternative to Photoshop, is actually reasonably expensive these days. However you do get a reasonably large selection of options available for your money. If you have no reason to plump for an Adobe product, it makes a good alternative to something like Photoshop Elements and of course you don’t have the monthly fees of Creative Cloud. There isn’t a free trial as such, but the £79.99 fee comes with a money back guarantee allowing you to get your money back if you’re not completely happy with the software after 30 days, so again it could be worth the risk.